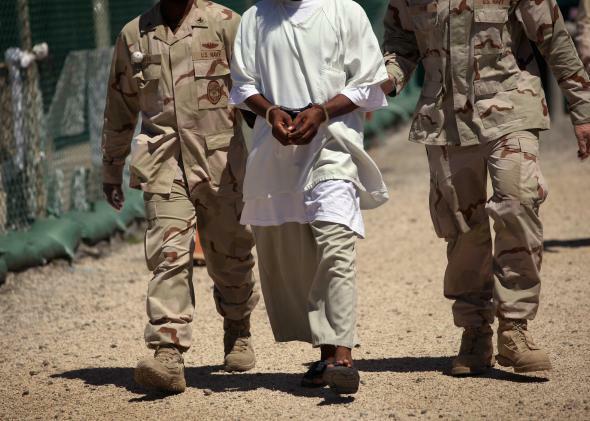 Four Guantanamo detainees sent home to Afghanistan. U.S. military guards move a detainee inside the detention center in Guantánamo Bay, Cuba on Sept. 16, 2010. Four Afghans who have been imprisoned in Guantánamo Bay, Cuba for more than a decade were sent back home, the Pentagon said on Saturday. The repatriation brings down the number of detainees to 132. Although the number is still high considering that President Obama vowed to close Guantánamo when he took office almost six years ago, it is “more than two dozen fewer than a year ago,” details the Miami Herald’s Carol Rosenberg. Several more prisoners are likely to be transferred out of the detention camp over the next few weeks before Republicans take control of Congress. The transfer is seen as a vote of confidence on new Afghan President Ashraf Ghani, who formally requested the four men be sent back to Afghanistan. Officials rushed to fulfill the request because they saw it as marking an era of improved relations between Afghanistan and the United States. An additional eight Afghans remain in Guantánamo.